Some of my favorite things in life include cupcakes and geeky things. But wait,, what if we mix both of those loves I have together? That would mean geeky things you can use to bake amazing cupcakes (or cakes, cookies, whatever). Or I suppose that could mean geeky cupcakes? Maybe we’ll get into those later 😉 but for now here’s a list of some awesome geeky things you can use in your kitchen. 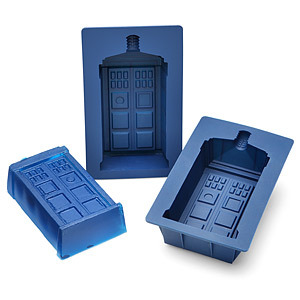 Doctor Who TARDIS Gelatin Mold Set I know it says “gelatin mold”, but I would definitely use this for mini TARDIS cakes or even chocolates. Yes, chocolates! Whether you’re a baker yourself or happen to know someone *coughs* who loves to bake too, then these baking items are perfect for a birthday gift or just a simple way to nudge someone into making you something delicious! Note: This is a guest post from the awesome Michelle, who runs her own cupcake blog, and guest writes for Geeking in Indiana from time to time. This work was hers, I just posted it up for her! I wish to thank her for her contribution to Geeking in Indiana!